Though originally designed as a purely practical device, full head-cover gas masks have worked their way into many imaginations as iconic, sometimes terrifying symbols. Because of this, a non-functioning costume gas mask is often just as useful as the real thing, and easier to get a hold of if you make your own. Though a real gas mask is made of complex parts,you can build a realistic-looking fake using common craft supplies and household objects. Attach the goggle lenses to the ski mask. Turn the mask inside-out, then place a line of hot glue around the edge of each goggle piece. Glue them to the inside of the mask's eye holes, facing out. After the glue hardens, turn the mask right side-in and trim the mask's existing eye holes wider to accommodate more of the goggle lenses. Put the ski mask on the wig stand. Form the shape of the respirators from the duct tape, cans and jar lid. Wrap the cans in duct tape from the bottom up, covering the bottoms and leaving enough extra tape to wrap up to attach to the mask. Tape the tuna cans to the lower sides of the face and the jar lid to the front. Use plenty of tape, wrapping it in place to form part of the shape of the attaching portions of the respirators, rather than just taping on the cans and lid. Coat the mask in black liquid latex. Apply several thick layers of liquid latex using disposable brushes. Allow each layer to dry fully before applying the next (drying time will vary according to thickness but will be apparent when the latex is fully firm) and continue to apply coats until the mask has a more or less consistent texture. Cut away the rear portion of the mask. Leave enough of the mask intact to cover the skull, but not the back of the neck, sloping up from the jaw. 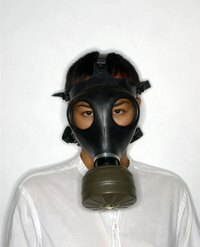 You can use the same techniques to create a different style of gas mask with a single respirator located in the front and center: simply use one small vegetable can.